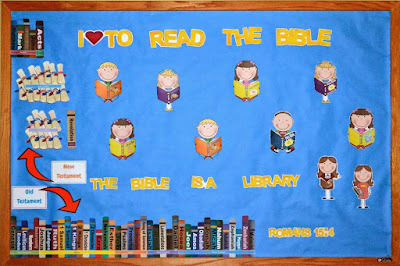 Bible Fun For Kids: Bulletin Boards! I have been changing a lot of bulletin boards after VBS! I feel like I have done a couple hundred, but no, it hasn't been that many! 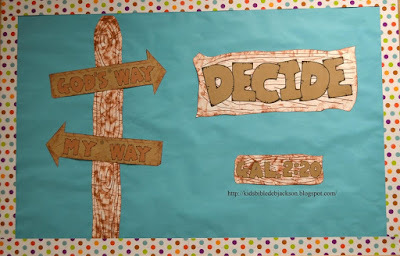 I usually have some sort of theme for each bulletin board post, but this one has too many different ones! 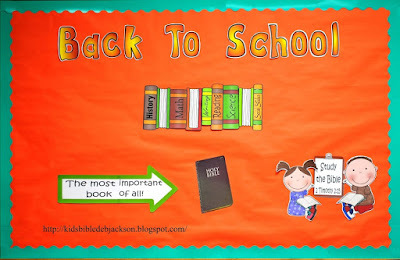 Some of these bulletin boards will have the printables for you to download, some will be partial and a couple are just for ideas and do not have any printables. First, I will show you this one in my class for Fall. I decided to go with Back to School and used books with different subject titles on the binders. Then, finished with a reminder that the Bible is the most important of all and to remember to study it! I do have everything for you to print and you can click here to download it. 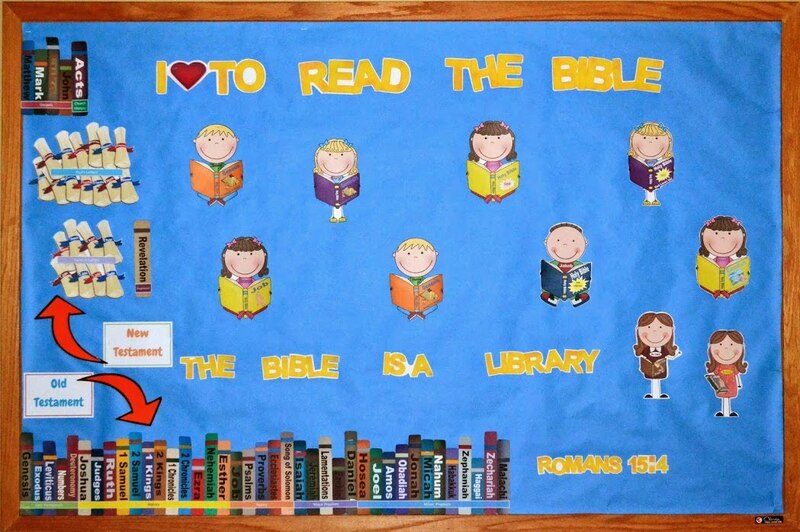 If you wanted to add more to the Back To School bulletin board, you could add the kids reading Bibles that you see above. Or, if you have room, the books of the Bible. You can see it here. 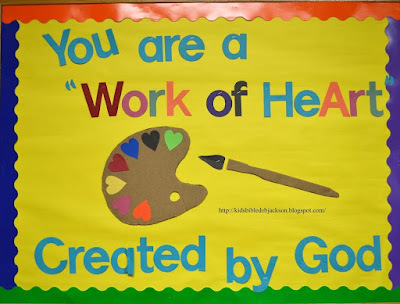 This bulletin board is self explanatory. For the trees, I purchased the graphics HERE, (I can't share them with you) and cut them into two parts. After printing them, I glued the two pieces together to make a larger tree. I used my Cricut machine to cut the letters. 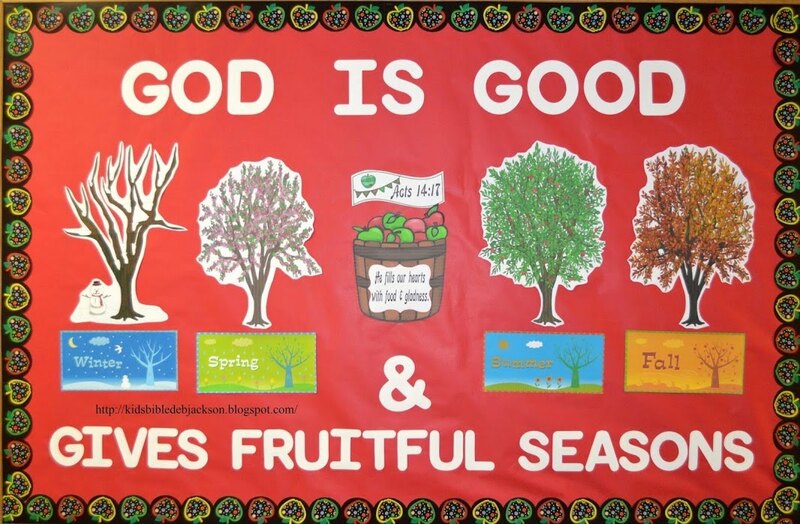 Click here to print the basket, scripture, and season labels. Click here to see the apple border that I purchased at my local teachers supply store. I thought up this bulletin board when I was working on the lesson for this parable. 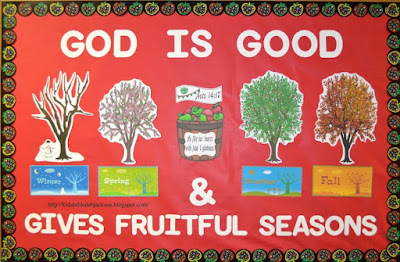 Click here to download the printables for this bulletin board. I used the overhead projector to enlarge the scripture. Since I don't have the plastic for the overhead, I print it, then I used a Sharpie to trace it onto a clear plastic storage bag. 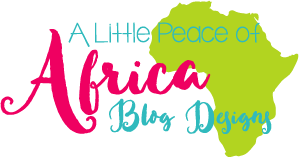 I did that for most of my VBS enlarging. 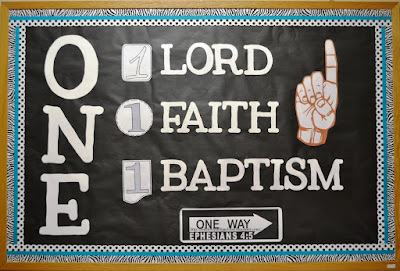 This board is in the main foyer, but is for the young folks. I just couldn't find anything on the calendars that screamed at me to do a bulletin board for, so I came up with this ONE. And, I don't recall doing a bulletin board with a black background, but I wanted it black & white, with the border having the ribbon giving a pop. I used Cricut Doodletype and cut the ONE on the left at 10 4.2". The other letters are 5 3/4". 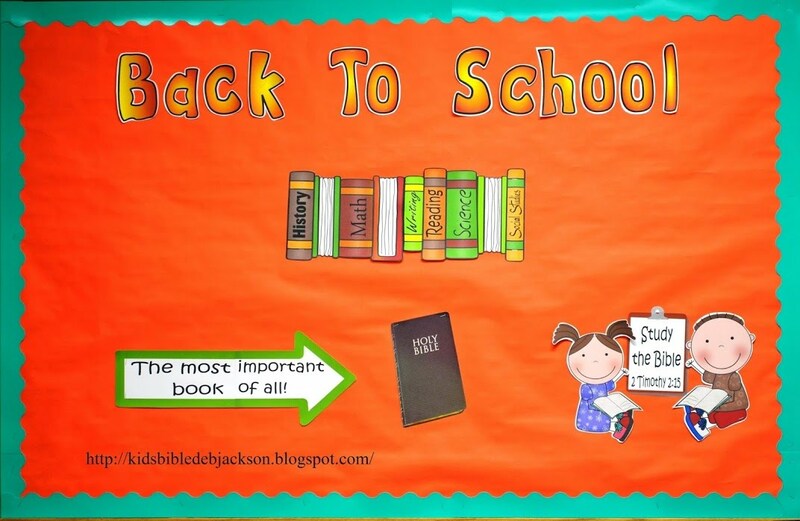 Click here to download the printables for this ONE bulletin board. 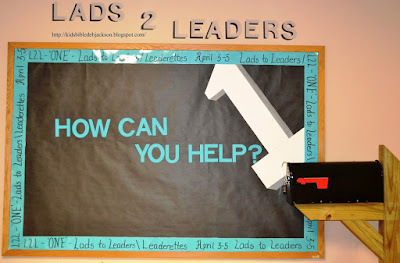 This Lads to Leaders (L2L) bulletin board was done by Nathan Hubbard, with a little help from his wife Kristin. I love the design! Nathan left room on the board for more information to be added. Thanks Nathan, for permitting me to share it here! 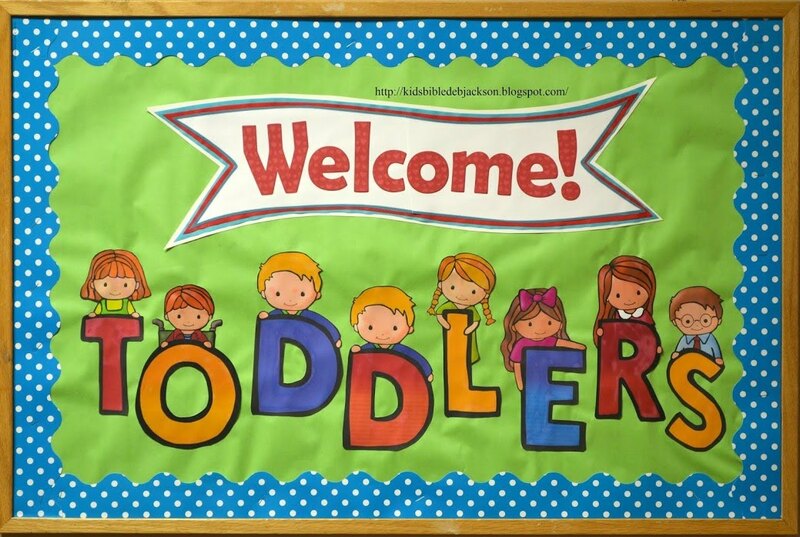 This smaller bulletin board is in front of the Toddler room. It doesn't get used, except to announce who the room is for. 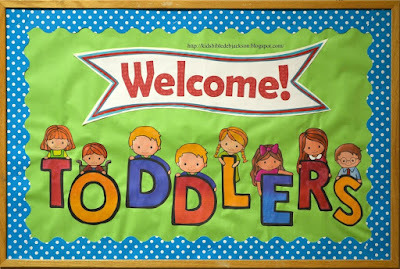 Click here for the Welcome banner, which can be used for any room. 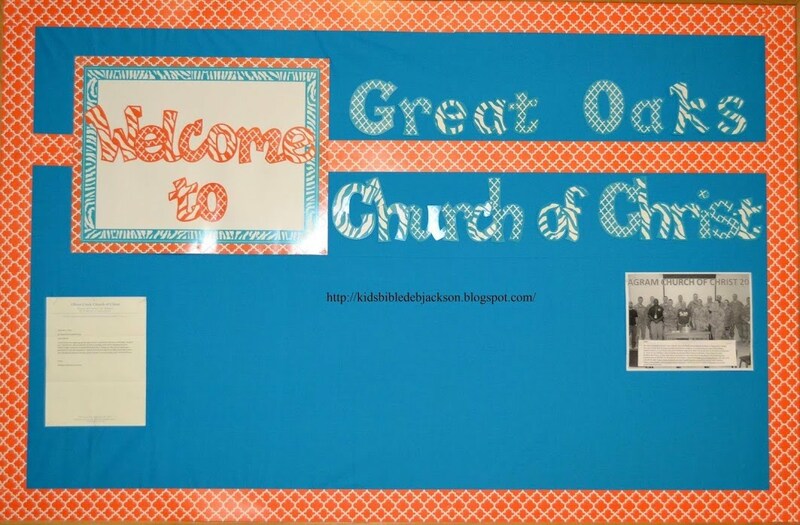 I printed it onto cardstock, then layered different colors of bulletin board paper. The bottom layer is white poster board and that made it very sturdy. 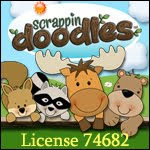 I am not permitted to share the Toddlers letters with you, but you can find the Alphabet Kids here. I used them at 7 1/2" for this board. I made this Jesus Loves the Children heart for the above Toddler board, but once I found the letters, this didn't fit. But maybe you can use it! Click here to download it. 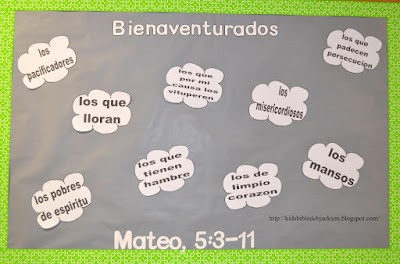 I also have this Spanish bulletin board idea for you. Esther has let me share this and it is the Beatitudes. You can print the clouds here. Here is a teen bulletin board. 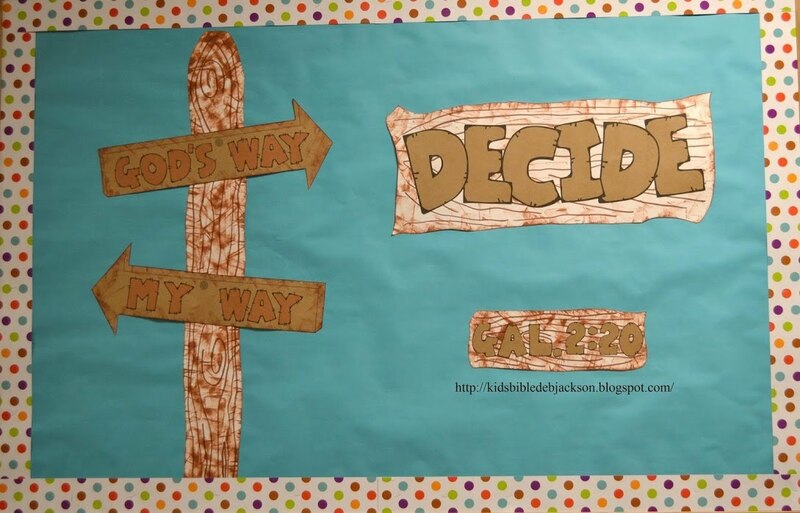 I had seen the street sign on Pinterest, and thought it would be a great bulletin board theme.Decide if you want to live God's Way or My Way. 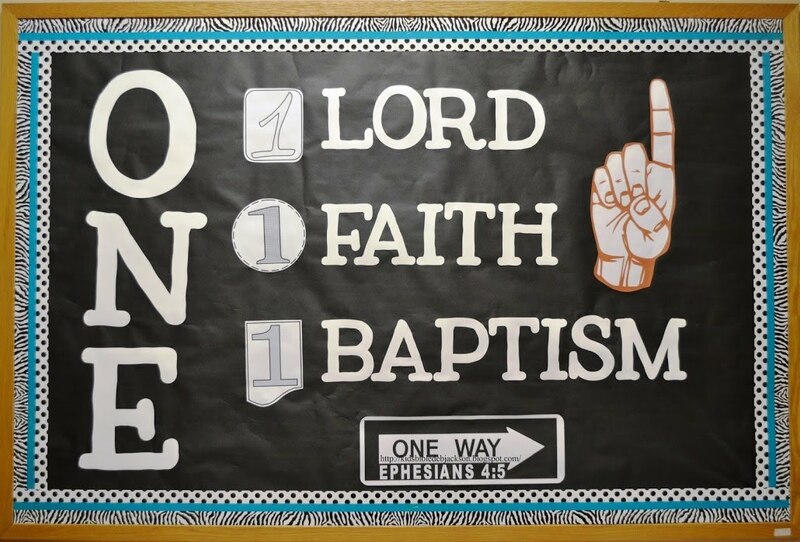 The God's Way arrow is pointing to their classroom, and the My Way arrow is pointing to the door. I printed the signs and letters onto a brown Kraft cardstock. I cut the sign post and sign backs onto poster board and drew lines to look like wood grain. You can print it here. 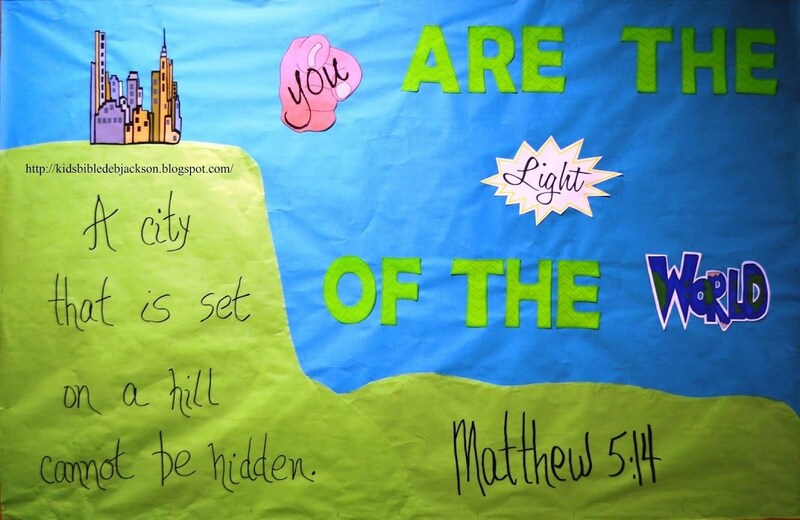 This bulletin board has been up for a long time, and I don't know who to give credit to for making it. It is in a room that isn't being used, but it's a good idea. These next couple of photos are to give you an idea on how I updated boards that you just can't do a whole lot with! Those pesky boards that people just poke stuff on and look really bad. This is in the main foyer by the office. I took the picture before all the papers were tacked back up. I used fabric for the back because you can poke tacks through it and it doesn't leave hole marks. I purchased everything here at Teacher Created (at my local teacher's supply store), including the matching alphabet, poster board and border. 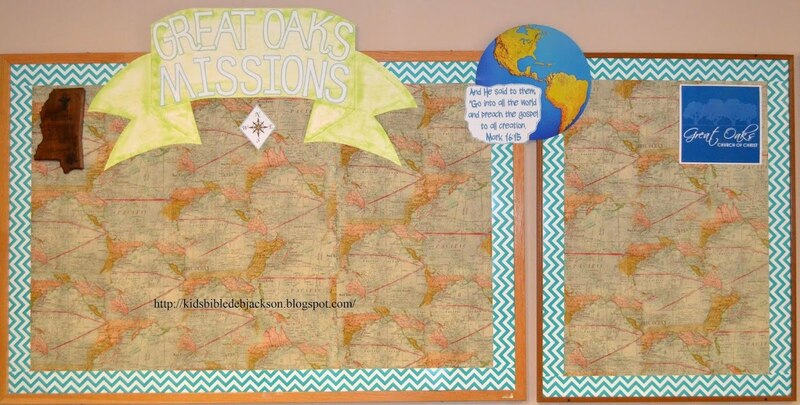 Another board that always has a bunch of papers and pictures on it is our Missions bulletin board. Again, I purchased fabric so tack holes won't show and things are added and moved around. I found a great fabric that had the world map on it at Hancock Fabric. I added the compass rose, earth (found at teachers supply store) and scripture and made the topper on poster board. I use scrapbook stamp pads to add the shading to the topper. 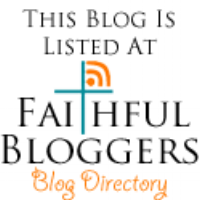 You can print the compass rose and the scripture here.